Are deadly interlopers raining on your parade? Is that oak tree continually making a fool of you with it’s large, woody trunk? Are you a horror movie villain in need of a scary weapon to swing at unsuspecting teenagers? Well, let us introduce you to this brand new product on the market. It’s called “axe”. Yes, from the makers of “club” and “spear” comes this handy little accessory that solves all of life’s little problems. “Axe” can be used for so many different purposes! Vikings can use it to fight against rival clans. Lumberjacks can use it to teach those darn trees a lesson. Crazy axe murderers from the movies can use it to do the whole axe-murderer thing. This Giant Double Blade Axe is a practice version of the iconic “axe”. The head of the axe looks like a slab of forged iron and even has a bronze paint job along the blade. The handle looks like real wood, so you get the full axe experience without any of the danger of a real axe. 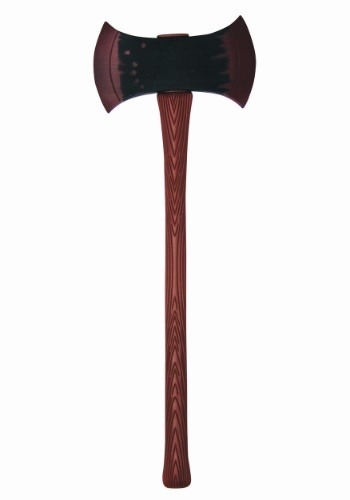 Once you have this toy axe, you can begin practicing your axe skills. Eventually, you might just be ready for the real deal!